The ball must be played before going forward to search. A player is considered to have moved forward if they have proceeded more that approximately 50 metres; however, if you need to move forward to get another ball or club or confer with a referee this is permissible. If both are not done, the provisional ball becomes the ball in play and the player is considered to have played under stroke and distance. As a result, a player can not search for a minute and then go back and play a provisional ball, if they go back and put another ball into play, the original ball will be considered lost and the second ball will be the ball in play. Once the original ball is found within 5 minutes of searching, the provisional ball must be abandoned. If a stroke is made at a provisional ball it is considered to be playing a wrong ball with a penalty of two strokes in stroke play and loss of hole in match play. In stroke play, the player must correct their error by playing the original ball or proceeding under an appropriate rule (eg Unplayable ball). A provisional ball can’t be used as a substitute for playing under stroke and distance under the unplayable ball rule. If a player wishes to proceed under stroke and distance, they must return to the place they last played, drop a ball and proceed from there. 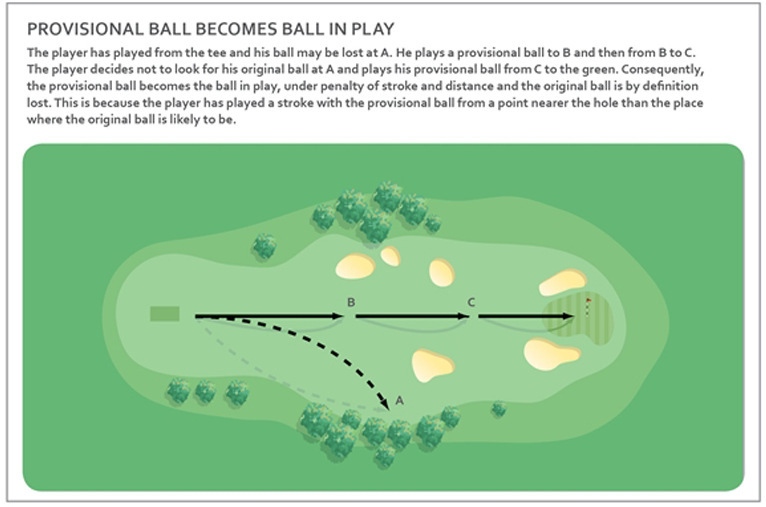 The provisional ball becomes the ball in play when either the original ball is lost after 5 minutes of searching or is played from at or nearer the hole than where the original ball is believed to be lost. If in doubt as to whether a ball is lost or not, play a provisional ball. The rules allow it and it avoids wasting time going back to where last played.